Lynn, Annie and Pandi: Annie is a Pomeranian who has had epilepsy since she was a pup. Her seizures have been controlled with Acupuncture only. Pandi, who is also a Pom started having seizures at the age of 8 years. 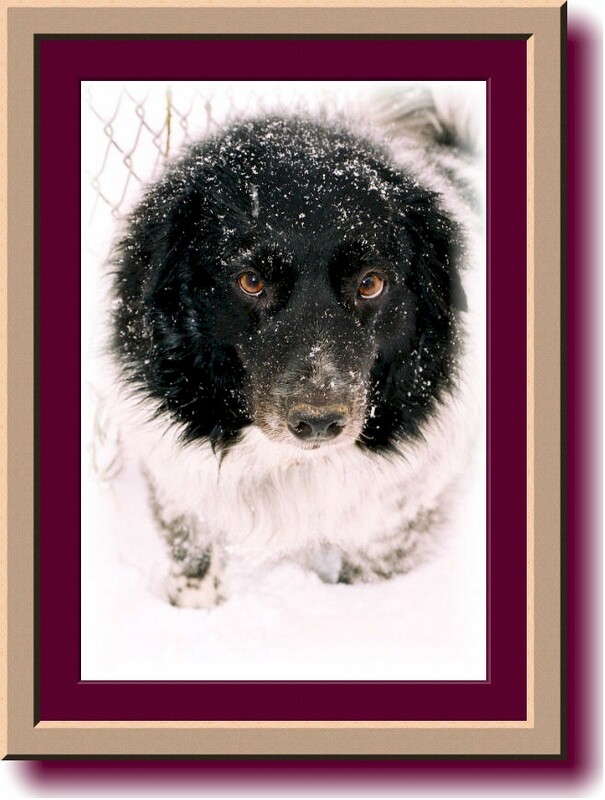 Pandi has been seizure free for 14 months. Medications and Food: Annie is not on any medications. Pandi is on Phenobarbital. Annie and Pandi eat boiled chicken and veggies with a little Innova dry and Wellness canned food and supplements. Marian and Tinker: Tinker is a 14 pound, 5 year old, spayed female yorkie mix. I adopted her from a shelter almost three years ago. She was abused, and a fear-biter at the time. Now she works with me every day at my antique store and is the official greeter. She was having terrible grand mal clusters. Her worst cluster was a 5 day period when she was seizing every three minutes. She is on .125 Soloxine b.i.d. 50 mg Milk Thistle b.i.d. The valium protocol has stopped the continuous clusters, although she typically seizes once a day for two to three days now, but I feel we have better control than previously. For the most part her seizures are milder. She has gained a lot of weight and is more lethargic with the meds. The bedtime muffin with melatonin has made a huge difference in her night-time sleeping patterns. We are no longer up and down all night. Now, if we could just get the extra weight off. 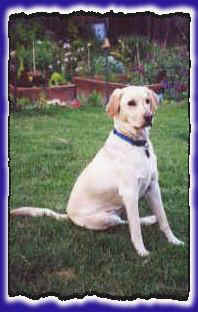 Marianne and Sage: Meet Sage, an AKC registered Labrador Retriever. Sage loves kids, sticks, long walks and a bowl full of food. At only one and a half years of age, Sage has not had an easy life. At five months of age she was diagnosed with OCD (where cartilage grows in a deformed manner) which resulted in the fracturing of her tibia in her hock. Luckily we were able to find a specialist who was able to remove most of the bone chips and implant two pins for support of the bone. Sage can run and play now, but sometimes gets a stiff and swollen joint if she does too much. At 13 months of age Sage had her first seizure. It was a Grand Mal lasting about three minutes. She recovered well, and we hoped it was an isolated incident. Two weeks later she had another and so on every two to four weeks. Determined that she would not go on medication, we opted for the holistic route. A home cooked diet with added vitamins and calming herbs such as Kava Kava, St. John's Wort and Valerian was tried for two months, but the seizures came with the same regularity. Finally with the worry of kindling on our minds we put Sage on Phenobarbital at the urging of our veterinarian. The results have been very good. Sage has not had a seizure since going on Phenobarbital. We have her liver function monitored every 3 to 4 months with a chemistry panel that contains the three liver enzymes GGT, ALT and alk phos because Phenobarbital can cause liver damage. We are so happy to have our sweet Sage with us. She is a beloved part of our family. We are also very grateful for this web site which has taught us so much and showed so much support. Maggie May (on left) with Lily Morena Mary Jane and Maggie May: Maggie May is a 6 1/2 year old chocolate/red/white beagle. She has lived with me since she was 6 weeks old. 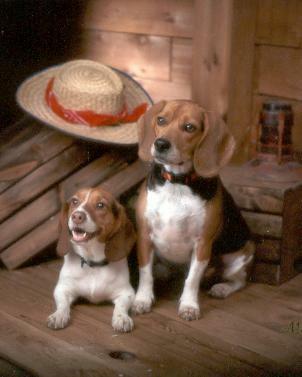 Her sister, Lily Morena, came to live with us when Maggie was two years old. 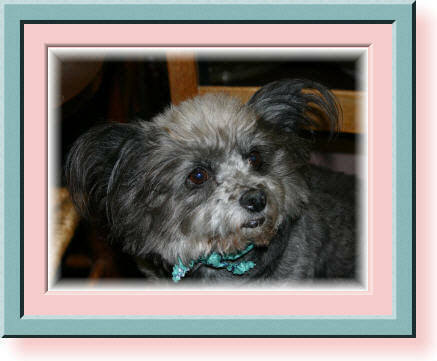 Maggie is very sweet and easy going but sensitive and loves to be with people. She had her first seizure when she was three years old. Because of the length of the seizure, she was immediately placed on Phenobarbital. She did very well on Phenobarbital and did not have a seizure during the year and a half that she was taking it. Maggie developed hepatitis late December, 2000. Although it was not felt that it was caused by Phenobarbital, the medication was discontinued. Maggie had a seizure 6 weeks later and then started with cluster seizures 3 months later. She now has clusters and her only treatment at this time is the Valium Protocol. During the past year I have been observing Maggie May very closely trying to understand what triggers her seizure activity. Maggie May is a certified Pet Therapy Dog and loves to visit the patients at a local hospital. She also loves Agility and playing with Lily. For more about that part of Maggie's therapy work, click here. For information about her agility successes, click here. Mary and Levi: I adopted Levi from the Humane Society in June of 2001. I was told he is a border collie, but I feel he may be a border collie mix. He was a stray, so his medical history, and age are a mystery to me. I didn't think it would matter...he had won my heart. The first year was wonderful...no health problems. Last July Levi had his first Grand Mal seizure. I had NO idea what was going on. The vet took a "wait and see" position. Three weeks later, he had a second one. I took him to the vet and he was placed on Kbr. We had 8 wonderful months, when the seizures began again. He had approximately 3 more Grand Mals and was placed on Phenobarbital in addition to the Kbr. In April 2003 he began having cluster focal seizures. The last episode being 5 focal seizures in 10 hours. I took him to the Animal ER where, as the neurologist put it, "he declared himself an epileptic." Levi isn't quite back to his old self yet, I'm praying it will happen in his own time, but I have seen a little improvement. He's not quite the high-energy, fun-loving border collie he used to be, but he still has my heart! Currently, we are in the process of switching his meds from liquid Kbr (3.5 ml) to capsule form (875 mg), Phenobarbital (60 mg/bid)until his Kbr is therapeutic, then we will be backing off. I have also used Rescue Remedy post seizure. We just want to thank everyone here for all the encouragement, understanding, and support they have shown to us. You are all truly, Guardian Angels!